Every 4th of July, we watch Independence Day. For us, it’s like some sort of explosives-filled, fiery amid-summer version of ‘It’s the Great Pumpkin, Charlie Brown”. Sure, it’s not exactly July anymore, but the reason I’m thinking about it now is … Ok, I was staring at this sentence for like 3 minutes hoping I’d figure out how to end it with some sort of well-formed reason but I’ve got nothing. Seriously, I have no clue why this has come to a head in my brain TODAY and not, say, months ago. It suffices to say that for whatever reason, I think I may have finally found that little chink in the armor that separates the film from “documentary caliber fiction that can only be disproved by reviewing history books and/or interviewing the cast”. Basically, I think I can finally put my finger on that ONE TINY THING that makes the film ‘unrealistic’. “But this movie is basically a documentary of how we’d fight off an alien invasion!” I can hear you saying. I totally get that, but- “How DARE you suggest otherwise! ?” As this imagine conversation progresses and you interrupt, your voice gets increasingly strident. Really, I understand, it’s not my intention to disrespect the sacrifices of all the people in the film who fou- “YOU’RE A MONSTER!” you scream in this now very alarming hypothetical conversation, lunging over the desk at me. Let me speak! Wait! Let me describe the one tiny atom of implausibility in this otherwise great ode to our national ‘Never say die, never moderate our defense spending’ spirit! It’s the magic TV wall. 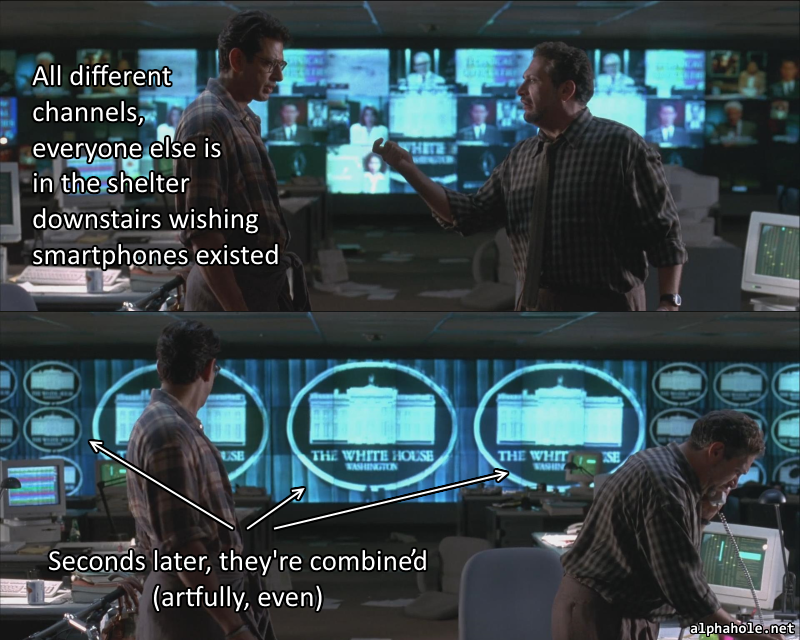 Next time you watch the film, pay attention to Jeff Goldblum in the TV network operations room with the wall of TVs. This is roughly 27:04:43.21 into the film. The aliens have invaded (spoilers!) and the TV network he works at has the ubiquitous ‘WALL OF ALL TELEVISION CHANNELS’ seen at every TV network in every film. Each monitor has some static but you’re clearly seeing a hundred different feeds from around the world. He’s basically alone with the wall (Harvey Fierstein is crooning into a phone with those sweet dulcet tones he’s famous for) and the rest of the staff is in the bomb shelter. Suddenly: over the period of like 1-2 seconds, all of the TV channels switch to be one big display like some kind of CRT Voltron. How does this WORK?! Is everyone around the world looking at a different part of the White House logo and then the president’s face? Who gets the chin, who gets the giant eye? Or does Jeff Goldblum’s TV system automatically recognize that some sort of significant ‘same signal everywhere’ event is happening and combine them even though it’s only 1996 or something? My god, they don’t even have the technology to put twitter feeds at the bottom of their display but we’re expected to believe this wall of televisions can just MAGICALLY figure out that it needs to look like one big TV? Too far, Dean Devlin & Roland Emmerich. You went too far. To me, this was the least believable part. …of a film that LITERALLY features an alien invasion that falls prey to Mac OS 7.